Last night, the Colorado American Marketing Association (CO+AMA) celebrated Colorado’s first class marketers at their annual Colorado Peak Awards. Corona Insights was honored to take home our 4th Gold Peak Award in the category of Market Research. This year, we won the award for our member engagement and brand assessment for the American College of Veterinary Medicine (ACVIM). Market research is fundamentally different from other categories honored at the CO+AMA Peak Awards. Market Research prepares brands and marketing campaigns for take-off. By doing proper research, companies are able to develop a sound marketing strategy that effectively reach their target audience. In 2013 we were recognized with a Gold Peak for the research we did for Donor Alliance which resulted in a marketing campaign that addresses the trends in the data we helped uncover. 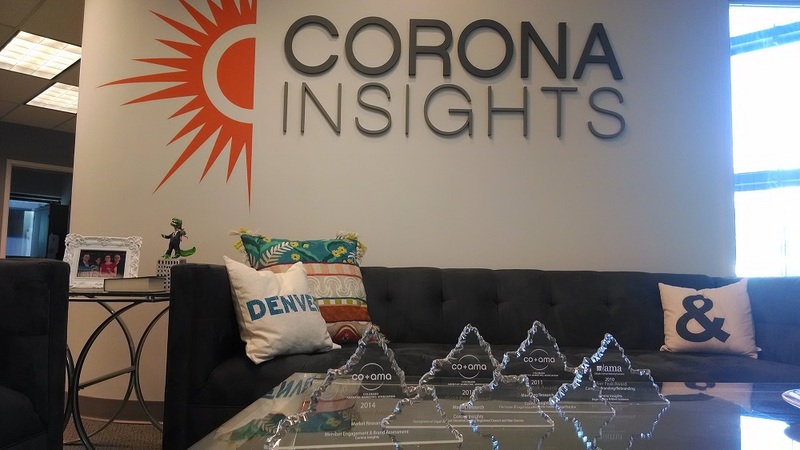 In 2010 Corona took home the Silver Peak award for our rebranding and in 2011 Corona won a Gold Peak award for our market research work to inform the University of Denver Sturm College of Law’s strategic plan. The 26th annual gala was held that Wings Over the Rockies and featured an aerospace theme. Kevin Raines, CEO, and Kassidy Benson, Marketing and Project Assistant accepted the award on behalf of the firm.